Jennifer Sarkilahti is the artist and designer behind the amazing NYC based jewelry line Odette NY. Her pieces are hand sculpted so you literally feel like you're wearing a piece of art rather than a plain old necklace! She recently came out with a Lookbook to help promote her latest collection and the end result is as beautiful as her jewelry so I had to ask if she could give us a behind the scenes look at how she put it all together. Oh and did I mention she did it all remotely!! ... So the thing is, I originally had wanted to do the photoshoot locally, but because of scheduling issues with the photographer I had hoped to work with and my own time constraints, I had to push that slightly more ambitious project to the next lookbook. Luckily, I had a fantastic photographer Charity de Meer from Florida who was willing to work remotely. 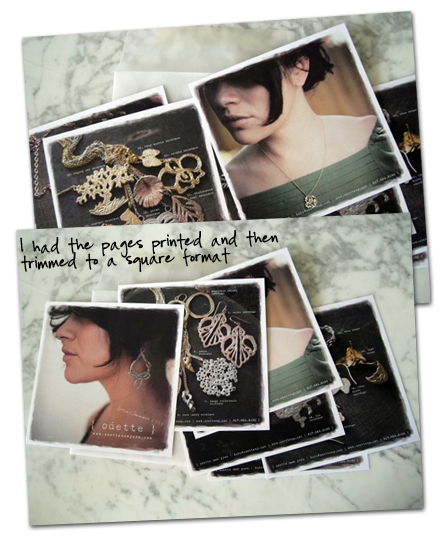 First, I sent her a batch of images that I had on my inspiration board for the shoot. Then I shipped her work to shoot and she found her own (lovely) model to work with. I wasn’t present for the shoot, so I really had to trust her as a photographer. It was kind of nice in that way as it became a bit more of a collaboration. Though I had originally wanted to have everything shot in polaroid, I wasn’t able to do it this time around, but I still wanted the final lookbook to have a similar feel. So I had the pages printed and then trimmed to a square format (Kinkos is great for this, they charge just a few dollars to do trims, which means a lot less time on my paper-cutter) and left them unbound so it would feel as though you were flipping through a stack of photographs. 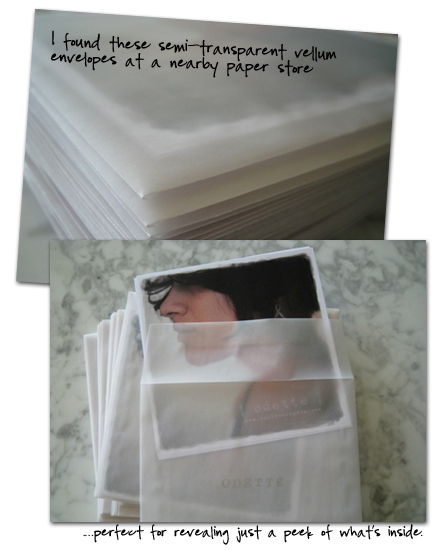 I found these semi-transparent vellum envelopes at a nearby paper store and thought they would be perfect for revealing just a peek of what’s inside. *sigh* Absolutely beautiful....beautiful jewels. I am in love with pretty much every design. I LOVE this look book and it's format. It is wonderful and I think the photographer did an amazing job as well. Thank you for reminding me of an artist I admire. Beautiful....what an amazing statement that will make to the customer!